Click here to sign up and go to the official F-Secure Anti-Virus website right now. Independent lab scores as reasonably good. But not close to great. F-Secure Anti-Virus has a fast full system scan. And its other features such as behavior-based DeepGuard detection system do a good job of ensuring that F-Secure Anti-Virus remains an antivirus powerhouse when it comes to fighting against malware. The only problem with F-Secure Anti-Virus is that it doesn’t come with any considerable number of extra features. All other great antivirus products have a ton of extra features and this puts F-Secure Anti-Virus slightly below the top of the pile. Antivirus products of today aren’t really just antivirus products. Today, they come with all sorts of extra features. And we’re talking about just those basic antivirus software programs. Nowadays these basic security programs have so many extra features that they can easily pass as security suites. ANtivirus products of today come with extra features such as spam filters, VPN services, and firewalls. If you have a feature in mind, it is very likely that an antivirus product would have it in its arsenal. It doesn’t want to roll like that. F-Secure Anti-Virus primary focus is to provide users with enough security systems so that they don’t have to worry about malware. There is no other central task. F-Secure Anti-Virus will defend a user’s system. It doesn’t take the risk to try something else. In other words, if you are mistakenly going to a fraudulent website or a downloading a dangerous file, F-Secure Anti-Virus won’t get in your way. It won’t steer you away from many other harmful activities either. And that is generally not a problem. Because F-Secure Anti-Virus core components perform well enough. F-Secure has this DeepGuard feature which is actually a behavior-based detection system. In fact, we have never seen F-Secure use a more powerful feature than DeepGuard. 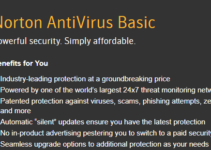 Most of the top antivirus products like to hit that sweet spot of $40 regarding their pricing. They all charge their users the same price. And there are many others like them but we won’t list them here. F-Secure Anti-Virus charges its customers $39.99 per year as well. But it is slightly different from other antivirus products in the sense that it allows users to install its security product on up to three devices. That is, you can install F-Secure Anti-Virus on three devices with just one subscription. If you take that into consideration then suddenly F-Secure Anti-Virus looks like a great deal. F-Secure Anti-Virus has a minimalistic user interface. Its main window has just the right amount of white space. The main window also has a couple of blue buttons. Users can make use of these buttons to launch system scans and interact with the settings dialog. Users can also see a couple of lines of text that appear in the middle of the screen. This text indicates that the antivirus protection is in its enabled state. Moreover, it also informs the user if the antivirus product is up to date. If F-Secure Anti-Virus senses something is wrong, it will turn the green looking check mark icon into a red X. There is also those usual pop-up notifications. These offer the users to fix any problems that F-Secure Anti-Virus may have found. Overall, the theme is pleasant and simple. And perhaps that is the reason why users find its layout so intuitive to use. F-Secure Anti-Virus designers have done a good job to streamline the user interface. And hence it is very easy to navigate to the option you want to in the least amount of possible clicks. F-Secure Anti-Virus has also gotten rid of some of the grips critics have held against it for the last couple of years. The main one though was with the antivirus product’s user interface. And it has improved remarkably this time around. Users can also click a Virus Scan button that appears right on the main menu window. Doing so will launch the Quick Scan feature. F-Secure Anti-Virus doesn’t really call it that, but most of the other antivirus products do. So that’s what we’re going to call it. The Quick scan isn’t really a complete scan. It only scans system areas which most malware try to affect. Understandably, the QUick Scan feature doesn’t take more than a minute or two. 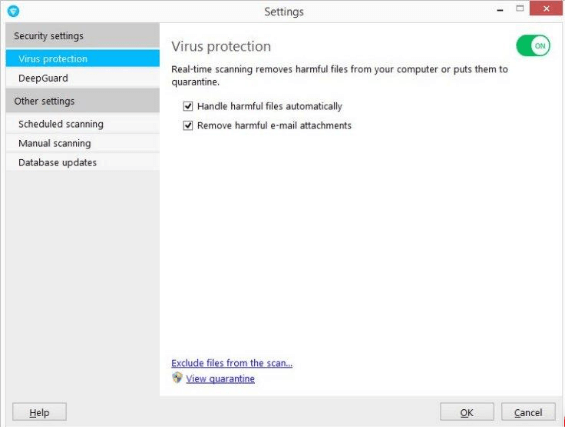 Moreover, F-Secure Antivirus installer program also runs a new cleanup scan feature very early in its process. 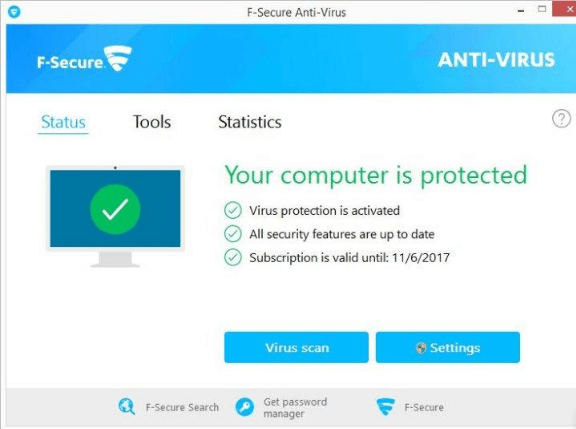 The purpose of that is to eliminate any remaining active malware that may or may not interfere with the F-Secure Anti-Virus installation process. We always recommend that users should run a full system scan as soon as possible. Because a full system scan would scan all the present file on a user’s system. Users should try to do that right after the installer has finished with the antivirus product’s installation. If you want to start the full system scan then all you need to do is go to the Tools page. And then pull down that Virus scan options that appear in the form of a menu. 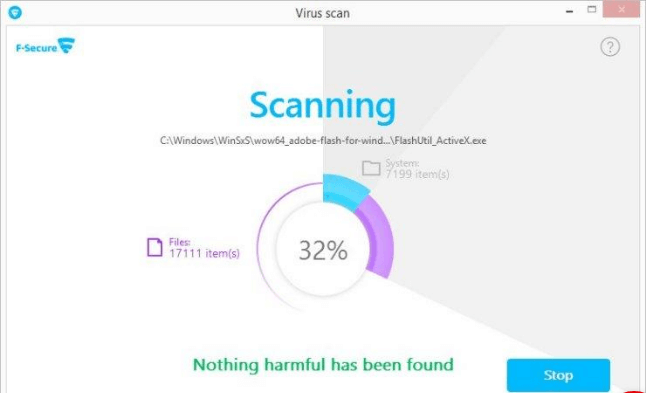 If you run the full system scan on a clean system then expect F-Secure Anti-Virus to take around ten minutes to complete the full system scan. The industry average is around 50 minutes. ESET NOD32 Antivirus is also fast but it takes around twenty minutes. So what happens through the duration of that full system scan the first time you run it? Well, as usual, F-Secure Anti-Virus goes through some routine optimization tasks. These help the antivirus product to speed up subsequent scan requests. How much time does the second scan take? It takes around five or six minutes. Other top antivirus products tend to speed up their second scans even more. Just to take an example, the ESET NOD32 Antivirus performs its second speed in about 30 seconds. There are tons of independent labs around the world. But we tend to follow just the five most important ones. Three of these, include F-Secure Anti-Virus as an antivirus product in their scheduled and regular testing sessions. As mentioned at the top as well, F-Secure Anti-Virus has a good set of scores with independent lab tests. But they aren’t anywhere close to outstanding. By that, we mean that F-Secure Anti-Virus can’t compete with the likes of Kaspersky and BitDefender Antivirus Plus. AV-Comparatives performs tests and then award antivirus products four possible ratings. Any antivirus product that manages to pass its tests gets to have a rating of Standard. If an antivirus product fails its tests then AV-Comparatives marks that antivirus product as Tested. If an antivirus product really performs well and goes over of what is the required minimum, then this lab awards it a rating of Advanced. Sometimes, when an antivirus product really passes a test with flying colors, AV-Comparatives awards it the Advanced Plus rating. The Advanced Plus rating is the top rating that this lab awards. Now, as mentioned before, AV-Comparatives performs a lot of security tests. We only like to follow five of these. And F-Secure Anti-Virus scores an impressive four ratings of Advanced and one rating of Advanced Plus. Other top antivirus products such as Kaspersky and Bitdefender have earned Advanced Plus in all of the five tests that we like to follow. Avira, another antivirus product, doesn’t take part in all the five tests. It only takes part in four. AV-Comparatives has awarded Avira four ratings of Advanced Plus in its four tests. AV-Test Institute carries out its lab tests in three phases. In other words, it ranks antivirus products in three categories. This independent lab awards a maximum of six points for each category. F-Secure Anti-Virus earned six out of the available six points in the Protection component. It earned five out of six points in the Performance category. That means, F-Secure Anti-Virus will slow down your computer a little bit. F-Secure Anti-Virus also earned a total of five out of six points in the Usability category. It means that you can expect F-Secure to give you a few false positives. Sometimes it will also flag valid files and/or URLs as potentially dangerous. That takes the F-Secure Anti-Virus total score to 16 out of 18 points. That is a decent enough score. But other antivirus products have done better. Trend Micro along with Kaspersky and Bitdefender have all scored 18 points out of the possible 18 points. MRG-Effitas researchers have a different way of ranking antivirus products. They have this Banking Trojan test. If any antivirus product fails to score a hundred percent success rate on this test, MRG-Effitas awards it a Failure grade. MRG-Effitas also has this Comprehensive All-types-of-malware test. This test also marks antivirus products with two grade. If an antivirus product blocks each and every single malware sample perfectly then it can earn a certification of Level 1. The only antivirus product that has earned that certification is Kaspersky. If an antivirus product can eliminate all of the traces of each and every malware sample within the time limit of 24 hours, then MRG-Effitas awards it the certification of Level two. If it doesn’t, then it earns a Failure regardless of its performance. We don’t know of too many antivirus products that have passed MRG-Effitas tests. And just like the rest of them, F-Secure Anti-Virus has also failed its Banking Trojan test. F-Secure Anti-Virus didn’t participate in the Comprehensive Malware test. IF we aggregate F-Secure Anti-Virus score on independent lab tests then we think it deserves a rating of 8.3 out of a possible 10. We know many other antivirus products that have performed better. For example, Kaspersky Anti-Virus has an aggregate score of 10. F-Secure Anti-Virus has a layered security system when it comes to malware protection. Its security system also included signature-based detection. If a malware or any other threat is new enough, then the antivirus product would leave the user vulnerable to that new threat. Even if a malware threat is not new, but security researchers and analysts haven’t come up with a signature for it, then too the antivirus product will leave the user open to such new attacks. Of course, good antivirus products don’t just rely on signature-based detection. They use multiple systems to detect malware. So what is F-Secure Anti-Virus’s answer to never-before seen and zero-day malware threat? A behavior-based malware detection system. Well, F-Secure Anti-Virus has this online database. This database can identify all known harmless files. F-Secure Anti-Virus also has a real-time antivirus engine. This engine can wipe out all known nasty files. When does DeepGuard jump in? It starts to kick in for each and every process that doesn’t fit either the “good” nor “bad” category. In other words, unknown files. Webroot SecureAnywhere Antivirus has a pretty similar component as well. Basically, it keeps an eye on all unknown processes. And then smacks them down once they exhibit a hint or a pattern of malware-like behavior. The best way to test antivirus products on your own is with malware samples. These are available from various online resources in the form of folders. Our research for this F-Secure Anti-Virus review shows that F-Secure Anti-Virus real-time protection system can identify and then eliminate up to 70 percent of such malware samples. Moreover, it can also flag some of the items as potentially unwanted. After that F-Secure also asks the user what the user would like to do with such files. Users are free to choose any option such as Quarantine. So we have already mentioned that F-Secure can block about 70 percent of the malware samples. Have you asked the question, what happens to the rest of the 30 percent? Well, that’s where we have to launch these remaining malware samples again. Our research for this F-Secure Anti-Virus review tells us that when F-Secure faces the remaining malware samples, its DeepGuard features comes into the picture fairly quickly. When these remaining malware samples go into their launch phase, F-Secure’s basic real-time protection versus viruses is enough to block some of these at launch. The rest have no other option but to succumb to F-Secure DeepGuard feature. DeepGuard analyzes their behavior and then gets to work. As mentioned before, Webroot has a similar feature. But it performs really well with a detection rate of 100 percent. It can take care of these malware samples either after launch or on sight. That is the reason why Webroot gets to have a rating of 10 out of a possible 10. But since F-Secure missed some, it gets a 9.8. That score is equally impressive. And what do you know, it is even better than Norton’s score. On that note, F-Secure even beats the likes of Trend Micro Antivirus Plus Security. We have already mentioned the fact that F-Secure Anti-Virus doesn’t come with any phishing protection. And no, it doesn’t have that trust malicious URLs blocker either. But that doesn’t mean that you can’t run malicious URL tests on F-Secure Anti-Virus. Even if an antivirus product doesn’t have malicious-URL blocking feature, it can still participate in such a test. It just has to block malicious URL and also has to wipe out malware-ridden downloads. Our research for this F-Secure Anti-Virus review shows that F-Secure can potentially quarantine up to 80 percent of those nasty downloads. The industry average is around 70 percent. Of course, no one can get close to Norton in this department that has a score of 98 percent. Avira Antivirus Pro has a score of 95 percent. F-Secure has published a white paper recently that explains that the DeepGuard feature can also function as a HIPS feature. HIPS stands for Host Intrusion Prevention System. It monitors programs like Java and Flash. Because more often than not, these are the same programs that hackers like to target and exploit in their cyber attacks. Moreover, the DeepGuard feature also keeps an eye on document types which hackers frequently use in their targeted cyber attacks. So how do we see DeepGuard in action when it comes to this category? We have to see how F-Secure performs on a test system that gets hit with around 30 exploits. How to generate these exploits? One can easily use the CORE Impact exclusive penetration tool. This can generate those required exploits. If the user has a fully patched system, F-Secure will block all of these exploits from penetrating the system. Moreover, our research for this F-Secure Anti-Virus also shows that its real-time antivirus engine can kick into action and eliminate around 40 percent of the malware-ridden payloads that come from the samples. We couldn’t really learn much about how DeepGuard helped F-Secure perform against these exploits. But we don’t have any worries about that since it makes sense. You see, DeepGuard doesn’t just jump into any malware threat. It only monitors for those programs that show malicious behavior. If and when a generated exploit tries to hit a program that is fully patched up and doesn’t have that corresponding vulnerability anymore, the exploit can’t harm the program. And since there is no malware-like behavior, there is no need for DeepGuard to kick into action with its behavior based detection. How Do The Best Host Intrusion Prevention Systems Perform? Well, these components usually block all exploit attacks via examining the test system’s network traffic. Then they move in and refuse a connection with the related exploit attack. We would like to mention Symantec Norton Antivirus Basic as an example here. It can block around 66 percent of all exploits in such tests. And it doesn’t allow any of these exploits to finish dropping the nasty malware-ridden payload. By now, you should know that DeepGuard has more aims than one. One of its aims is to protect the user against all ransomware attacks. We already know that average antivirus components usually miss these ransomware attacks. So how do you check for ransomware attacks? It is very easy to check for protection against ransomware attacks. Basically, you have to turn off that real-time virus protection engine. And then launch a venomous series of ransomware samples. Our research for this F-Secure Anti-Virus review tells us that F-Secure can easily catch ransomware attacks. And it can also identify it for the user as a nasty application. Users have the privilege to configure their DeepGuard feature as well. 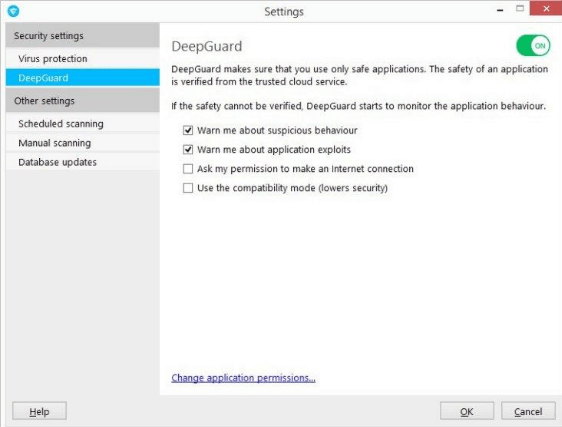 Some may want DeepGuard to only warn the user when an unknown application or program tries to connect to the internet. For example, you may want to try out a new cutting-edge web browser. You inform DeepGuard that you trust the new software application or program. Then it will do its work in the background. Think of it more like a program control feature that old firewalls used to come with. Of course, modern users would find little use of this feature. Then it is better if you don’t mess with it. What do we know about the previous edition of F-Secure Anti-Virus that came out last year? Well, we know that it included a special link that enabled the users to install a feature-limited but free version of the F-Secure tool known as system booster. Now, you have another link. This link appears at the bottom of the user’s F-Secure main window. If the user clicks it then it takes the user to F-Secure’s official page. This page allows the user to, again, install a free version of another one of F-Secure’s security products. This time around, F-Secure is offering its F-Secure Key product. It is basically a password manager. Of course, we don’t think that it is the best password manager that you are likely to find, but there is no harm in giving it a try. But know that you may waste a lot of time on the free version of this tools. Because it doesn’t sync user’s passwords across all devices without the user paying for the real Premium version. The main window comes with another link as well. This link launches the official F-Secure search. It is a search portal. And as usual, Google powers it. But it comes with the additional benefit of F-Secure’s color-coded website icons which flag each of the Google’s search results. Think of them more like a reputation meter. Other antivirus products such as McAfee and Norton also have this feature. And just like in those antivirus products, F-Secure icons also use the green, yellow and red colors to indicate safe, iffy and dangerous links respectively. There is also the gray icon. This icon indicates that the site on the search results page is currently on the list of not-analyzed websites. If you can’t remember all these color codes and what they mean then don’t worry. F-Secure has a legend guide that is present on each and every search engine result’s page. F-Secure goes one step further though. It also uses the blue icon. This icon shows users the sites which F-Secure considers as allowed sites. It has a different shaded red icon for sites which it considers as “denied”. Of course, you will find no meaning in these indications if you actually don’t install your copy of F-Secure via F-Secure Safe suite which works on multiple platforms. What do we mean by what? Well, if there is no administrator then regardless of the blue or red icon, no one can really band or allow sites. Only an administrator can permit or deny access to certain sites. Administrators can also un-ban sites. Using F-Secure’s Safe suit you can also unblock sites that F-Secure considers as dangerous. There is no doubt about the fact that F-Secure is solely focused on protecting users against malware. That where all of its efforts and abilities are spent. This is F-Secure’s main task. And it does a pretty good job of removing any and all entrenched malware. Moreover, it also protects users by blocking further malware protection. As mentioned before, F-Secure Anti-Virus is effective at this particular task. Our malware research shows that F-Secure Anti-Virus can detect a perfect 100 percent of all malware samples. And what about that F-secure system scan feature? It is fast as hell. In other words, it can beat most of the other antivirus products when it comes to time-to-complete-a-scan. F-Secure loses marks for not offering extra features such as phishing protection and a warning system against fraudulent or malicious websites. But that doesn’t mean it won’t block them. Our research for this F-Secure Anti-Virus review shows that it does block malicious URLs. Well, via its real-time protection system. It can wipe out slightly more malware-ridden downloads that the average antivirus product in the industry. The antivirus industry has transformed into something huge. There are at least forty odd great antivirus products now. But five of them really stand out. Each of these options come with its own set of advantages and disadvantages. You will have to look at each of these antivirus products to know which one best matches your requirements. Of course, you can always go with F-Secure Anti-Virus if you want an antivirus that protects you against malware. Period.